A fellow of infinite jest, of most excellent fancy. 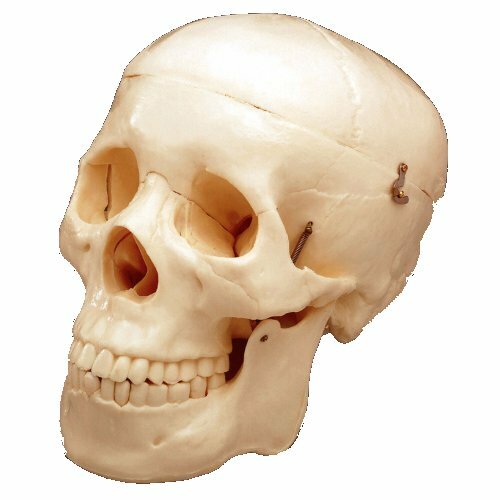 You'll want to make house room, or classroom room, for this nice budget skull in molded bone-colored plastic, about 8" diagonally from chin to back of cranium, with a handy removable and latching cranium and a spring-loaded jaw. Comes complete with a full set of teeth, (3) removable plus three spares-(2) lower front and (1) molar. Or woman. This 10” tall human torso model looks male, but stops short of the naughty bits. In either case, there are plenty of interesting removable organs inside, including intestines, liver, stomach, heart and lungs. Torso is on a 5" x 3" base, and comes with a spiral-bound, 22-page manual, with augmented reality activities available in 3D videos via your smart phone. For ages 8+. You don’t even have to open this mouth to see what’s going on inside. 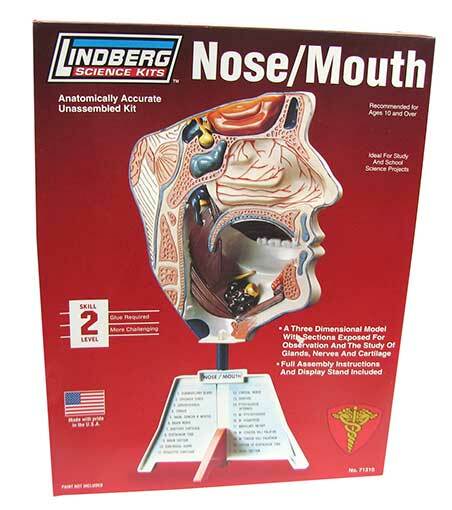 Our anatomically accurate Lindberg plastic 3-D model of the human oral and nasal parts and cavities shows (21) parts in cross-section, including nerves, glands, arteries, tongue and much more. You build it and add glue and paints. Will be 11” tall on its included stand when finished. For ages 10+. Made in the USA, so it’s an American mouth. The human body is a puzzle, really. 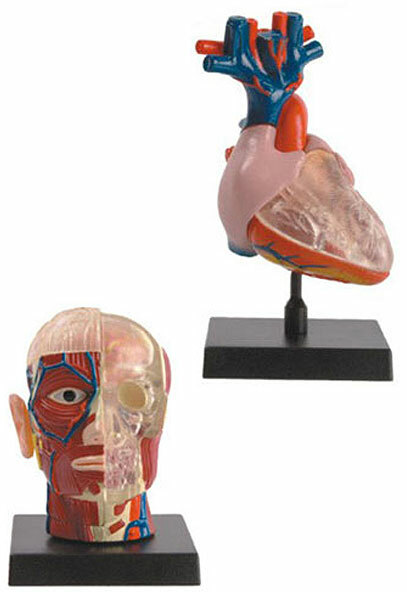 Get a head-start on anatomy class with one of these anatomically correct breakaway models in authentically colored plastic with detailed cross-sections. Pick the 2" tall, 7-piece eyeball; the 3-1/2" tall, 6-piece human heart; or the 3-3/8" tall, 6-piece rubber and plastic human head/skull/brain. All stand on 3" square bases. Play The Who while you’re building this collection of all (5) sensory organs. 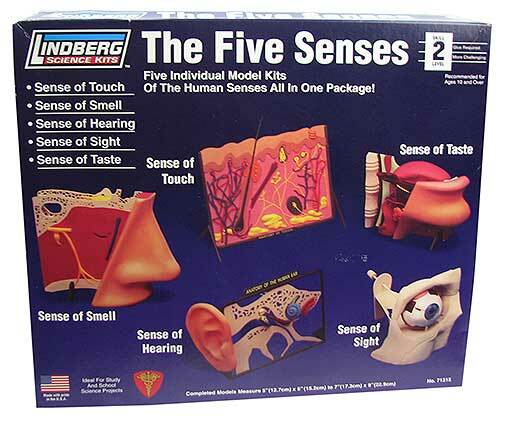 You’ll get the parts to make free-standing Lindberg models of a nose, eye, ear, tongue and patch of skin to illustrate the senses of smell, sight, taste, hearing and touch. Models measure 9” x 5” x 6” to 7” when complete. You add paint and glue. For ages 10+. An eye way, way bigger than life-size, in fact. Our PVC scale model of the human eyeball breaks away into sections so you can see the inside, with blood vessels and musculature. Approx 5-3/4" dia on a removable 5-3/4" dia x 3" tall stand. Stands 9" tall OA and comes with a fact sheet. 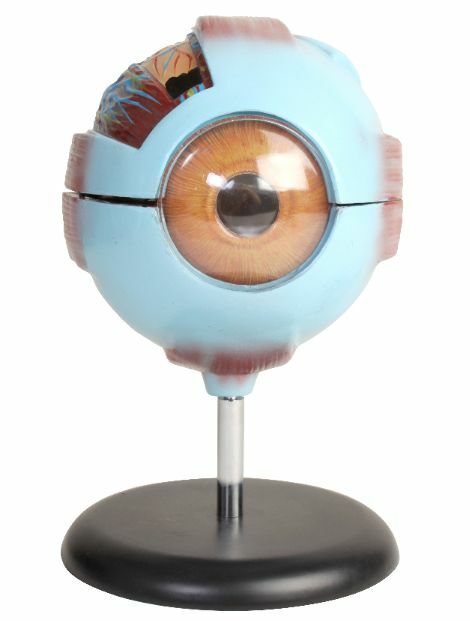 It's an optometric/ophthalmological/biology lab must-have, but it would make a distinctive and colorful objet d'biologie on anyone's mantel. You're not going to blow money on an actual human skeleton, are you? 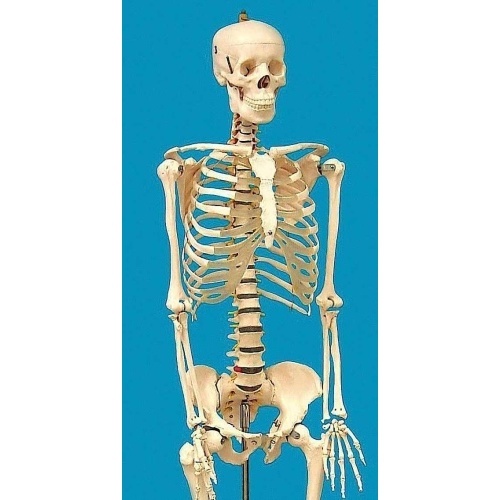 Consider that for a tenth of the price you can get an anatomically accurate skeleton done in plastic. This model is male (judging by the hips) and has many articulated joints-jaw, shoulder, knee, etc. Its small size (33") makes it practical for classroom use, since it can be passed around the room. Other nice touches include discrete neck vertebrae, a sectioned skull, and very little "flash" from the plastic molds. It also comes with a metal display stand, weighted at the bottom to prevent spills. Yes, some concessions had to be made because of the size and price, but this is still an invaluable teaching tool, and quite a nice decoration for those with morbid minds. 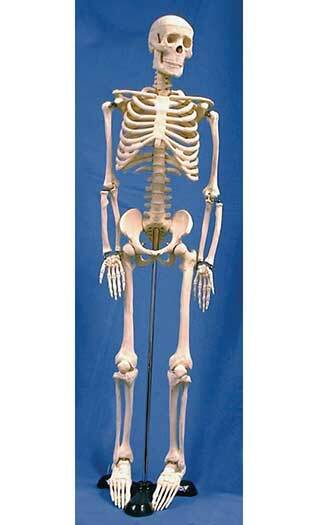 This skeleton is actually used in medical and other schools for teaching. The bones are plastic, but other than that it's as realistic and anatomically correct as they come. The ready-to-use skeleton is mounted with a 360° swivel at the pelvis from a heavy-duty metal rod on a stand base with castors. It has a skull with a removable section, hinged jaw and (2) removable teeth; plastic zippered dust cover; and stainless steel wire, brackets and wing nut assembly for long life. It's articulated at all joints except the spine, so you can demonstrate flexion/extension, or merely pose it in a debonair posture. Size: 5' 6" tall. Weight: 23 lbs. Just like your own, but in rubber instead of bone. Our super realistic, anatomically correct skeletal hand and foot models are great for a medical office, anatomy lab, art studio, Halloween party, or just to add a little orthopizzazz to your living room all year long. You choose the right hand and wrist, 8” long on a 4-1/4” square base with a detailed diagram of dorsal and plantar views; or the equally detailed right foot and ankle, also 8” long on a square base with the same views diagrammed. From United Scientific Supplies, Inc.
Oh, My Heart, My Beating Heart! 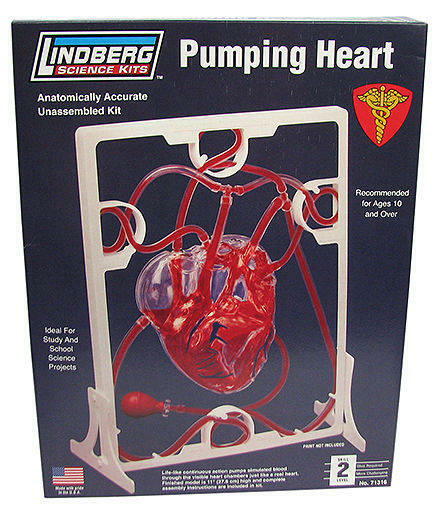 There's nothing quite like the thrill of assembling your very own clear plastic heart model and pumping red fluid through it for the first time. This classic kit includes tubing, instructions, rubber squeeze bulb, plastic frame, and of course, both atrial and ventricle chambers. You supply the glue and snips. Also comes with a small bag of red dye for coloring your own water, though we'd opt for blue food coloring or highlighter fluid and a blacklight for Halloween displays. 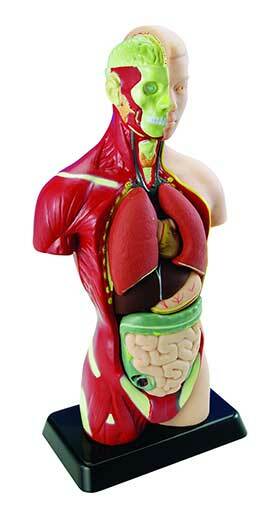 The anatomical model stands 11” tall when finished, and is recommended for budding cardiologists ages 10 and older. 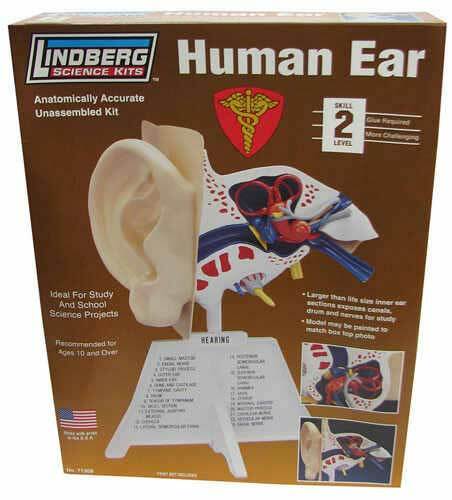 Our human ear model from Lindberg Science Kits™ is 4-1/2” long (even bigger than Lyndon Johnson’s or Alfred E. Neuman’s ears) with (23) components, including the famous hammers, anvils and stirrups, listed on the stand. Will be approx 7” tall including that stand. Includes detailed instructions. You provide glue and paint. For ages 10+. Made in the USA.